As summer continues, you may want to keep an eye on these sites to stay up to date on the various sistahs out there who travel. Traveling has been considered more of a Black American pastime in recent years. So whether you are looking for ways to travel solo, with a group, or even to support Black-owned travel businesses, look no further. Check out the following sites to learn everything you need to know about stepping your travel game up—whether it’s tips on traveling with other, gaining info about specific destinations, or how to plan your next vacation. The travelistas on this list are industry leaders and entrepreneurs. The companies listed below are owned or led by Black women. These women are not only travelling the world, but utilizing travel as a means to center Black women on the international stage. They are writers, artists, and most importantly, globe trotters with a mission to break down cultural barriers. And they are also promoting and encouraging more women of color to travel the world as well. They have found ways to turn their love for travel into a lifestyle and career that enriches them. Here are seven sistahs who will make you want to grab your passport and hope on a plane in no time. Nomadness is an urban travel online community founded by Evita Robinson with over 9,000 members worldwide. The Tribe organizes invitation-only trips for members, meetups, and conducts travel workshops. Nomadness also runs a popular blog and produced the web series, Nomad-ness TV. The goal of No-Madness is to promote global community building, both among travelers and between travelers and locals, and to encourage young people of color to explore the world with passion. 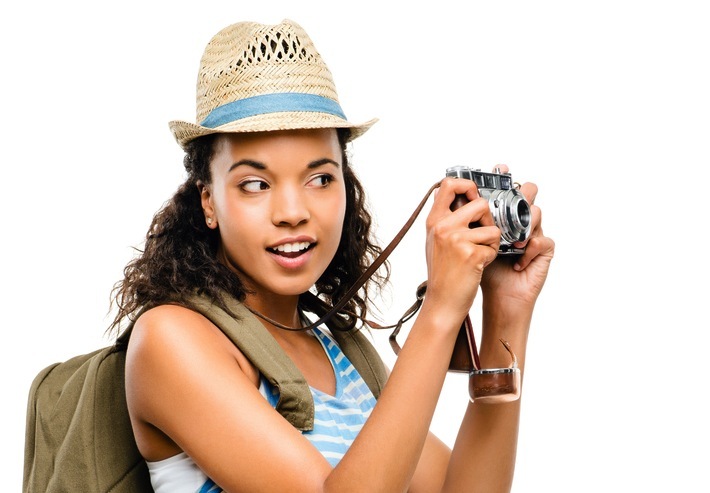 Nikki is a lawyer, writer, and amateur photographer with a passion for globetrotting. An avid Facebooker and blogger, the International Travel Chick is now turning to YouTube to produce a new travel web series about her international excursions titled Travel Unplugged.If you aren’t able to pick up your passport and hop on the next plane just yet, following International Travel Chick will fulfill your wanderlust and maybe inspire your next trip. Brown Girls Fly was founded by sisters Chelle and Crystal Roberts, who both share a desire to see the world. The site is mainly an online resource that provides curious travelers with details about traveling—from practical tips about packing, to blogs about international destinations. The Roberts sisters also share their unique insights and experiences traveling as a Black woman. If you are looking to get informed about all aspects of your potential traveling experience beyond just what to pack, I recommend visiting this site. Blue Zaria is a travel curating company that focuses on enriching the lives of Black women through both domestic and international trips. The company is led by two educators and the dynamic duo designs luxury travel experiences and journeys that nurture the woman's soul, inspire the spirit, and celebrate the essence of each woman. Blue Zaria trips include women’s empowerment activities as well as lots of relaxing, shopping, and exploring of local cultures. Visit the site to learn more about becoming a Zarianista and booking for upcoming trips. Urban Travel Girl is a blog started by Maureen Jenkins, a freelance travel writer, where she chronicles her experiences as a Black woman living around the world. Jenkins has lived abroad in France and Italy, and now resides in Chicago. Her blog provides lots of detailed accounts of her international excursions. If you are considering setting sail from American shores, reading through Urban Travel Girl may be a great first step in learning more about living abroad as a Black woman. Black Girl Travel is a travel company and club that creates extraordinary travel experiences for Black women. BGT aims to expose Black women to the beauty of the world, and the world to the beauty of Black women. The company plans trips to multiple destinations throughout the year. And their website provides travel tips and resources on everything from packing light to financing travel. Juhanna Rogers is a regular contributor to For Harriet and resides in New York state. She is a travelista and aspiring scholar. Her research explores the impact of international travel on Black American students and faculty.